When the opportunity to walk the Inca Trail in Peru came up, in the year of my 40th birthday and in support of The Forget Me Not Children’s Hospice, I couldn't really say no. As well as being something I have always wanted to do, raising money for Ascensor’s chosen charity made this a real win/win opportunity. Over the last six months we have undertaken various fund raising schemes to move towards the £3,500 needed to take part in the event on our Just Giving page. We held a sponsored firewalk, did raffles and other competitions. Walking the 4 day, 48 kilometre trail with me where five ladies that I had not met before, Donna, Sam, Charlotte, Sue and Lyndsey and we were accompanied by a UK guide Adele from the organisers, Jagged Globe. Our guide on the trail was Eddie from Tucano Tours in Peru. We flew out on Saturday the 6th September and after a couple of changes we landed in Lima the same day (with a six hour time difference). The following morning we flew to Cuzco (the ancient capital of the Inca era) for altitude acclimatisation, the city is 3,300 meters above sea level. After a day and a half in Cuzco (including a short hike up above the city and a tour of some Inca archaeological sites and museums) we travelled by bus to 82 Kilometre (so called because it is 82 km along the railway from Cuzco) where the trail started. Day 1 was relatively easy walking, gaining about 300 metres of altitude from our start at 2,700 and walking for 12 kilometres. We were supported by an excellent team of porters who carried our food, tents and evening kit. Each day we had breakfast, lunch, afternoon snack and dinner, all expertly prepared by the chef. We walked from 11am until 4pm on the first day before relaxing over dinner and a good night’s sleep before Day 2, arguably the most challenging day of the 4. We were up at 5am on Day 2 for breakfast before starting our hike, during which we would ascend over 1,200 metres and cross ‘dead woman’s pass’ before descending to our camp site on the other side. This was the day when the altitude was most noticeable, often we would need to break after 20 meters but began to find it easier taking smaller steps and walking for longer. The emotions were high when we reached the summit of the pass (4,215 meters), a real feeling of accomplishment. We could see the weather was turning from cloudy to wet and headed down to camp, barely making it down before the heavens opened with a tropical storm and hailstones. We hadn’t seen Lyndsey all day and heard that Adele had taken her back down due to altitude sickness. Day 3 was supposed to be a short day to camp which would leave us around a 5 hour hike on Day 4 to make it to the sun gate for our first view of Machu Picchu. We made a decision on the night of Day 2 that if the weather had cleared we would be woken at 4.15 am to walk right through (some 27 kilometres) to Machu Picchu, if it was still raining we would rise at 5am and stick to the original plan, we were in the hands of the sun god. It could have been either time when we were awoken on Day 3, it was pitch black, but it was clear and it was 4.15am. We had breakfast and set off at 5am. We made great pace and were at the place where we were due to camp just after 10am having hiked over the second and third pass (both around 4,000 metres), meaning we would make it all the way through to Machu Picchu a day early. After lunch we pressed on and arrived at the sun gate at about 4.30pm. Eddie our guide had us all close our eyes and walk through, when we opened them we saw the most beautiful thing – Machu Picchu basked in sunshine, this was what we had come to see. The sun gate is about 45 minutes up from Machu Picchu and on the winter solstice the sun perfectly beams through the gate and into the sun temple in Machu Picchu. The views from this place are stunning, perfectly revealing the Inca settlement and clearly showing why it remained a secret for over 500 years. 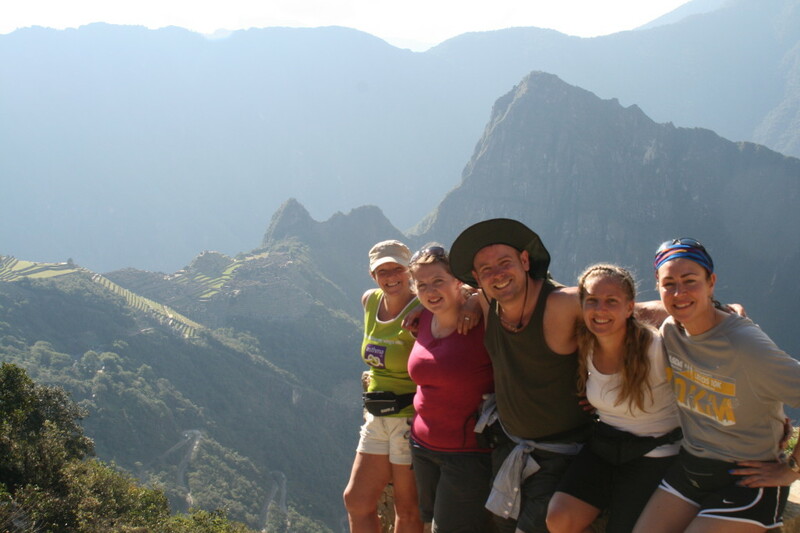 The three day hike revealed so many sights, preserved Inca ruins, beautiful wildlife, jaw dropping views. There were laughs and tears and a sense of adventure, we had been on a journey where we had pushed ourselves to the limit, completing the 4 day trail in just 3 days. Our entry passes to explore Machu Picchu were for the Friday, Day 4 so as Adele hadn’t made it to the sun gate with us we set off up from our hostel in Aguas Calientes at 4.30am and hiked the 600 metres back up to the sun gate. Unfortunately the cloud was heavy but we got a great view of Machu Picchu shrouded in mist to compliment the stunningly clear views the day before. We travelled back to Cuzco and the following morning began our 24 hour journey back home. The whole experience was without a doubt the best of my life, I cannot thank Sam, Sue, Charlotte, Lyndsey, Donna, Adele, Eddie, our amazing porters and Chef, the Hospice, Jagged Globe and Tucano Tours enough for making this happen. The whole trip was perfectly organised and extremely professional. If you haven’t walked the Inca Trail I cannot recommend the journey enough! You can still donate to the Just Giving page here!